Assistant Secretary Billingslea welcomed improvements in the Kurdistan Region, especially in its economic infrastructure, government reforms, and the development of the private sector. He also expressed his country’s readiness to assist the Kurdistan Region and Iraq to strengthen their economies and reform government institutions. Erbil, Kurdistan Region, Iraq (cabinet.gov.krd) – Prime Minister Nechirvan Barzani received the Hellenic Republic’s Consul-General to the Kurdistan Region Efthymios Costopoulos and his accompanying delegation. As the first Consul-General of the Hellenic Republic to the Kurdistan Region, Mr. Efthymios Costopoulos stressed developing bilateral cooperation between the Kurdistan Region and the Hellenic Republic (Greece). 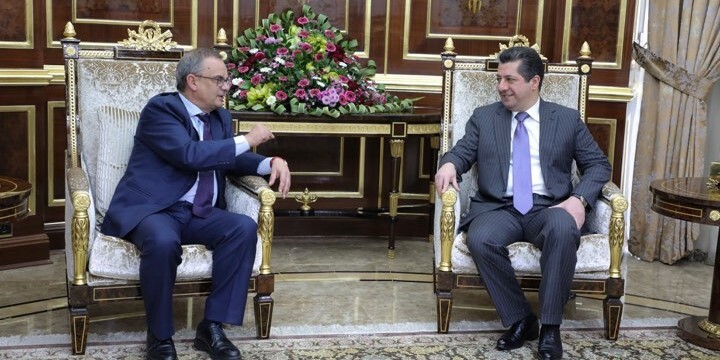 He praised the tradition of tolerance and coexistence in the Kurdistan Region and commended the Kurdistan Regional Government for having hosted, accommodated and offered assistance to an extraordinary number of internally displaced persons. Prime Minister Barzani assured Consul-General Costopoulos of KRG institutions’ full support to the Greek Consulate General. He presented a brief overview of the post-ISIS situation, reconstruction of devastated areas and relations between the Kurdistan Region and Baghdad, expressing his government’s full support to the new Iraqi government led by Prime Minister Adel Abdul Mahdi. Latest political developments in the wider region were also discussed in the meeting.